So you want to be a NottsNight reviewer? NottsNight prides itself on honest, independent blogs. And we’re on the look out for folks to write new reviews or to keep tabs on the existing ones. You should be willing to write good, honest reviews based on your own personal experience of a pub or bar. You should not be connected with the pub’s management, staff or parent company. 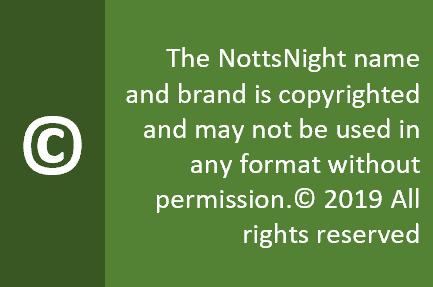 Additionally, you agree not to use the NottsNight name or brand in order to get freebies! And of course, you must be over 18. NottsNight is completely voluntary and does not pay for reviews submitted. Reviews may be edited for length and to meet the general house style, which is outlined below. The NottsNight Editor has the final say on whether a review is published. Reviews may be updated, added or deleted at the founder’s discretion. 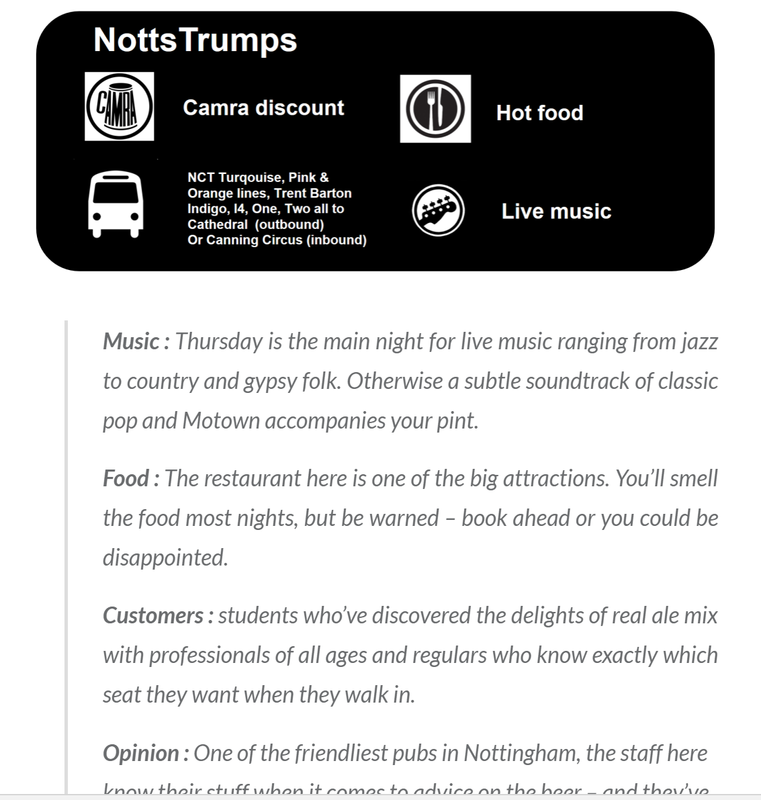 Simply email the text of your review and at least one picture of the pub or bar to nottsnight@gmail.com. Take a moment to look at the tips for writing your review below. We prefer generic views of the building and its features. Please, no selfies or big close ups of individuals! Ideally, the text should be either in the body of your email or as a word attachment. Photos can be in JPEG or PNG format. First thing’s first – you don’t have to worry about designing the web page or its styles. We’ll take care of that! Our reviews follow a common style of three paragraphs. 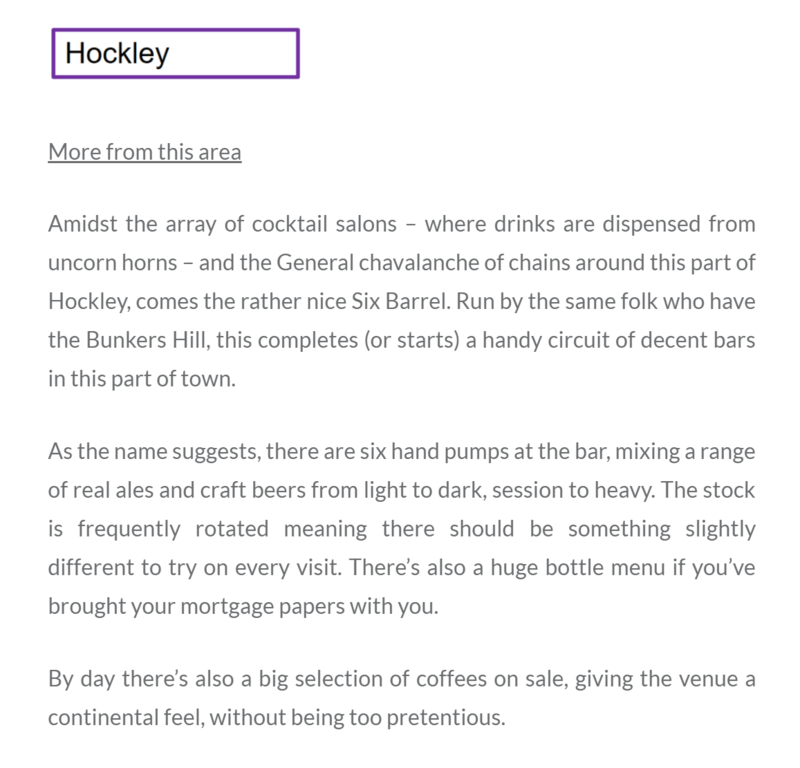 The first provides an introduction of where the bar is and how it fits into the neighbourhood. The second briefly describes the beer selection, while the third adds in any extras like food, events or special features. Take a look at the review for Six Barrel Drafthouse for an idea of how it works. Don’t forget, we also need at least one decent quality picture. These can feature the interior or exterior. Ideally, photos should be taken in landscape mode and emailed in the highest quality format you can manage.